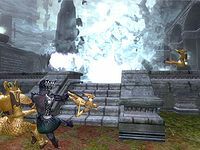 The Greymarch is an event that happens at the end of every era in the Shivering Isles, intended to wipe out the entire realm so that Sheogorath must rebuild it. It starts with the appearance of large crystalline obelisks that emerge from the ground. These obelisks produce and are the power source of Jyggalag's minions, the Knights and Priests of Order. The Greymarch is the end of the cycle that the Daedric Princes cursed Jyggalag to endure every era. It is characterized by irresistible brute force, with very little in the way of subterfuge or any variation to previous methods. It is unknown when the Greymarch first began. Long ago, before recorded time, the Daedric Prince of Order, Jyggalag, was growing in power and influence, spreading across realms and dimensions. The other Princes, growing fearful of Jyggalag's power, cursed him to become an embodiment of what he hated most: chaos and madness. The Prince of Madness, Sheogorath, was born that day. 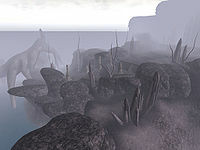 Sheogorath turned Jyggalag's domain into the Shivering Isles, a realm reflecting his madness, and once every era he would become Jyggalag once more to destroy the Isles and reclaim his realm. With that accomplished, he would transform back into Sheogorath, who would be left to rebuild his realm. As part of the Greymarch, Sheogorath summons a mortal champion to the Isles to fight back against the forces of Order. Sheogorath then disappears to become Jyggalag. The Greymarch ends when Jyggalag destroys the Shivering Isles, and the mortal champion mantles the role of the Mad God. Upon the conclusion of one Greymarch, the remnants of the mortal champion became Haskill, a Vestige who serves as Lord Sheogorath's chamberlain. This may also be true for all such champions. It is possible that Arden-Sul was a mortal who had mantled Sheogorath previously, as suggested by the beliefs of the Zealots and Heretics. In 3E 433, the Champion of Cyrodiil arrived in the Isles to play the role of the mortal champion. The Champion mantled Sheogorath, and also defeated Jyggalag and the forces of Order. Supposedly, the Champion finally broke the cycle by defeating Jyggalag in combat, and Jyggalag believed himself to be free from the curse; but it is possible that it is simply a part of the cycle. However, Sheogorath also believed that the Champion of Cyrodiil was a novel approach. As Sheogorath, the Champion of Cyrodiil stated that the title of Mad God is one which "gets passed down from me to myself every few thousand years". Few mortal inhabitants of the Isles ever live to see a second Greymarch; although they do not age without Sheogorath's will, few seem to survive the event. Sheogorath states that the Greymarch happens at the end of every era, but no indication is given that these eras are the same as Tamrielic Eras. Some sources state that a Greymarch occurs once every 1,000 years, while others claim several thousand. For in-game information, see the Shivering Isles Sheogorath and Jyggalag articles.